"Place the crankshaft in Vee blocks supported at the locations called out in the Table of Limits and using a surface plate and dial indicator measure the run-out at center main bearings. If this total indicator reading exceeds the dimensions given in Table of Limits... the shaft must not be reused." Interesting to note that the dimension table referenced is blank and always has been blank. There are no center-main run-out limit in the Table of Limits! Need we step further into this mess of sloppy limits? It appears that overhaul shops have been using the limits posted in the adjacent column titled "Clearances" even though they did not measure a clearance and the clearances listed make no sense.1 There is no basis of rejecting your crankshaft. Just what is a Runout? What the heck are we measuring when we measure runout? The run-out measurement described in Lycoming's overhaul manual is a circular runout measurement. Another type of runout, Total runout, measures something different and is not described here. When one says runout it is assumed to mean circular runout. Circular runout is neither a dimension nor a clearance but a displacement measurement that encompasses roundness (concentric) and position; a composite measurement. Being a composite measurement means that there are both form (roundness) and off-center (position) that make up our reading. Off-center for example might be because the crankshaft is bent. Something undesirable. Several automotive engine build books incorrectly describe runout as the amount the crankshaft is bent. It could be or it might not be. It could be a little bent and a little bit not round. Or it could be straight but not round. We really don't know what the problem is. All we can say is that circular runout is so much. This means that our datum axis is displaced so much or the datum axis has so much eccentricity. Lets assume for a minute that both roundness and position are perfect, but as we rotate the shaft in the Vee-block the shaft walks up the side of the Vee block ever so slightly. We have not measured a feature or dimension of the crankshaft but the movement of the shaft up the side of the Vee-block.2 Lets assume again our perfect shaft but the table sags slightly from the weight of the crankshaft. We have now measured the amount of sag. So just because we get a reading that is non-zero we cannot assume that this is attributable to the crankshaft. Maybe these other influences are just enough to throw the measurement past the specification. We want to be careful that we don't reject an expensive crankshaft based on table sag! 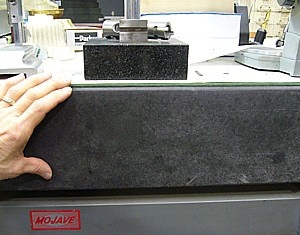 Six inch thick granite flat plate used to prevent table sag and produce a reliable datum (datum simulator). We eliminate these non-crankshaft influences by making sure our datum axis is reliable. Note how the shaft in the picture is held in position by Vee blocks that are along the length (axis of the outside surface). This is called the axis of the surface and is our reference point or datum. Runout is measured with respect to this datum. Sometimes the datum is defined and sometimes it is assumed but there is always a datum for runout. 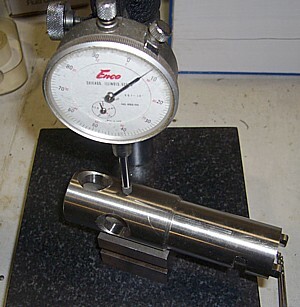 Any runout measurement must begin by making sure that the datum doesn't change. Runout can be caused by the datum not being round. Runout also occurs if the datum has a form error (3 lobed) pattern. Roundness of a journal can be corrected possibly by polishing or grinding the journal to an allowable undersized. This brings up my next point about "the shaft must not be reused". If the test shows the crankshaft is outside of Limits then it is past limits and fails the test. It might be reused after further repair such as restoring roundness in the journal which the same overhaul manual approves. It might also be that our datum is not reliable -- a common problem with runout measurements and we need to apply some quality assurance checking to our datum. When making or interpreting measurements it helps to have a clear understanding of the measurement process, what we are measuring, and the tolerance limits; especially when rejecting expensive crankshafts! First, verify that the datum axis is reliable by performing a runout inspection of the datum axis. A non-zero runout means your crankshaft journal is not round (oval) and changes your crankshaft runout measurement; It might increase or decrease it depending on the phase angle. In other words, without a reliable datum axis, your crankshaft runout measurement cannot be used to "declare" the crankshaft bent or straight. The process is simple; At the point where your v-block supports the shaft, position the dial indicator over that section of the shaft and the shaft section is revolved in the v-block to allow the indicator to register any ovality present in that section of the shaft. That section of the shaft can be checked for taper by moving the indicator lengthwise. There are other runout inspections for crankshafts. One common one on aircraft piston engines is "dialing the flange" to determine if the flange is bent. This is a face rounout which measures radial tolerance (perpendicularity) with respect to the outside surface of the journals. When this test is done on the aircraft errors in measurement can easily be several thousandths of an inch. 1. The clearance column shows a non-zero minimum clearance so presumably a perfectly round and straight crankshaft who's runout is zero is below limits for clearance and is not to be reused. As this makes no sense whatsoever it is in error to use the clearance column as a substitute for dimension. Runout is neither a dimension nor a clearance; it is a displacement. Runout can never control size. 2. Measuring runout requires that the axis of rotation be held constant through rotation. Vee blocks all but guarantee that this will not be the case. Circular runout in this case is set with respect to the outside surface being the simulated datum.